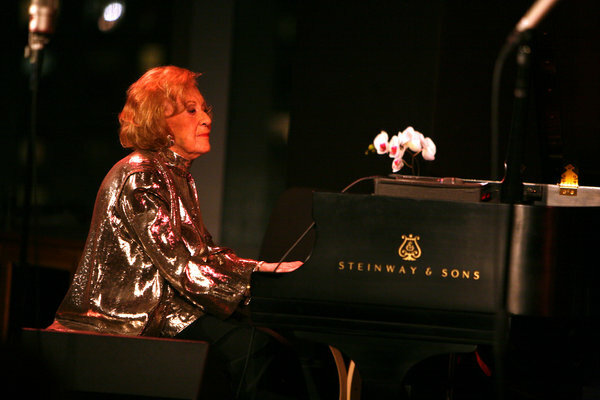 Marian McPartland at a celebration of her 90th birthday in New York in 2008. Marian McPartland, the genteel Englishwoman who became a fixture of the American jazz scene as a pianist and, later in life, as the host of the internationally syndicated radio show “Marian McPartland’s Piano Jazz,” died on Tuesday at her home in Port Washington, N.Y. She was 95. Her death was announced by NPR. The odds against any woman finding success as a jazz musician in the late 1940s and early ’50s were formidable, but Ms. McPartland overcame them with grace. Listeners were charmed by her Old World stage presence and captivated by her elegant, harmonically lush improvisations, which reflected both her classical training and her fascination with modern jazz. By 1958, she was well enough known to be included in Art Kane’s famous Esquire magazine group photograph of jazz musicians, the subject of Jean Bach’s acclaimed 1994 documentary, “A Great Day in Harlem.” One of the few women in the picture, she stood next to one of the few others, her friend and fellow pianist Mary Lou Williams. But Ms. McPartland’s contributions to jazz were not limited to her piano playing. An enthusiastic and articulate spokeswoman for the music, she lectured at schools and colleges and wrote for Down Beat, Melody Maker and other publications. (A collection of her essays, “All in Good Time,” was published in 1987 and reissued in 2003.) Most notably, for more than 30 years her “Piano Jazz” was one of the most popular jazz shows ever heard on the radio. The show made its debut on NPR in 1979, with Mary Lou Williams as the first guest. The format was simple: an informal interview interspersed with extemporaneous duets. “I didn’t have any idea I’d be good at something like this,” she told The Associated Press in 2000. “I certainly never thought people would know me because of my voice.” But she proved a natural. As its title suggests, “Marian McPartland’s Piano Jazz” was originally a show about piano players. But the guest list eventually came to include vocalists, among them Mel Tormé, Tony Bennett and even Willie Nelson, and ultimately trumpeters, saxophonists and other instrumentalists. Jazz pianists remained the focus, however, and over the years Ms. McPartland played host to some of the most famous, from the ragtime pioneer Eubie Blake to the uncompromising avant-gardist Cecil Taylor. She gamely played duets with all of them, even Mr. Taylor, whose aggressively dissonant approach was far removed from Ms. McPartland’s refined melodicism. “Piano Jazz” was heard on more than 200 radio stations all over the world. It received a Peabody Award in 1983. Ms. McPartland recorded her last show in September 2010, although she did not officially step down as host until November 2011; “Piano Jazz” has continued with reruns and guest hosts. Marian McPartland was born Margaret Marian Turner in Windsor, England, on March 20, 1918. She began picking out melodies on the family piano when she was 3, and at 17 she entered the Guildhall School of Music in London. In 1938, over her parents’ strong objections, she left school to go on tour with a four-piano vaudeville act. “My mother said, ‘Oh, you’ll come to no good, you’ll marry a musician and live in an attic,’ ” she recalled in 1998. “Of course, that did happen.” While on a U.S.O. tour in 1944 she met the American jazz cornetist Jimmy McPartland in Belgium; they married in early 1946, and she moved with him to Chicago later that year. Ms. McPartland worked for a while in her husband’s group, but he was a tradition-loving Dixieland musician and she was more interested in the harmonically sophisticated new sounds coming from New York City, where the McPartlands moved in 1949. Encouraged by her husband, she formed a trio and found work at the Embers, an East Side nightclub, in 1950. Two years later she began what was supposed to be a brief engagement at the Hickory House, one of the last surviving jazz rooms on the city’s once-thriving 52nd Street nightclub row. That booking turned into an eight-year residency. The McPartlands’ marriage ended after two decades, but they remained close friends and continued to work together occasionally. The divorce, she was fond of saying, did not take. She helped take care of him when he was found to have lung cancer, and they remarried shortly before he died in 1991. Information on survivors was not immediately available. Halcyon released 18 albums in 10 years and had a roster that included her fellow pianists Teddy Wilson and Earl Hines as well as Ms. McPartland herself, but her career as an executive ended when she signed with Concord Jazz in 1979. She remained a Concord artist until she stopped recording, just a few years before her death. The bare-bones accompaniment of bass and drums was always Ms. McPartland’s preferred format, but she also appeared in concert with symphony orchestras, and in 1996 she recorded an album of her own compositions, “Silent Pool,” on which she was accompanied by a string orchestra. That album provided a rare showcase for an underappreciated aspect of her talent: although she told The New York Times in 1998 that she “never had all that much faith in myself as a composer,” she was a prolific songwriter whose work was recorded by Peggy Lee, Tony Bennett, Sarah Vaughan and others. In her last years, Ms. McPartland received several honors. She was named a National Endowment for the Arts Jazz Master in 2000, given a lifetime achievement Grammy Award in 2004, inducted into the National Radio Hall of Fame in 2007 and named a member of the Order of the British Empire in 2010.